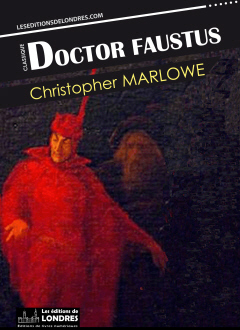 “Doctor Faustus” or “The tragical history of the life and death of Doctor Faustus” is a play by Christopher Marlowe first performed in 1594 and later published in 1604. “Doctor Faustus” is adapted from the German “Faust”. Faustus is bored; he has reached the limits of knowledge in many disciplines. He asks his servant to call on two famous magicians. These magicians explain to him how to call on the Good angel and the Bad angel: they give their own perspective of Satan, and Faustus is dissuaded. Then Mephistophilis, Lucifer's servant, appears and talks to Faustus. He explains to him how hell has no physical location, rather that it is a state of mind. Faustus is surprised by his appearance as he has not called for him, but Mephistophilis explains that for anyone who abjures the scriptures, the Devil will send his emissary. Faustus strikes a deal; he will get 24 years of life during which Mephistophilis will be his servant, after which he will be damned and live in hell for eternity. Faustus will consistently ignore the opportunities for salvation which are presented to him. He is damned for eternity. The myth of Faustus has become so famous that we often forget it is not new. Its parallel with the Greek myth of Icarus is obvious. In both cases, the presumptuous man pays the ultimate price for getting too close to the devil; Man is a victim of his own hubris. “Doctor Faustus” is probably the most controversial of all Elizabethan plays because of its theme, the constant mentions of the devil, and Faustus' refusal to accept redemption when it's offered to him. Marlowe was accused of nearly everything. In 1632, William Prynne goes so far as saying there were actual devils appearing in the play, and that some people were driven mad by the mere sights. But the most important issue Marlowe was confronted with was the accusation of promoting Calvinism. The fact that Faustus sells his soul to the devil, then refuses salvation, shows he was predestined and was not part of the elect. His damnation was inevitable. At the time Marlowe writes the play, Calvinism was on the ascent in England. With his strange death and the “legend” that derived from it, Marlowe may have paid the ultimate price for his blasphemous play. There are two versions of the play. One is the 1604 quarto, the A text, which is a much shorter version. The 1616 quarto is a version called the B text. For years, scholars have not agreed on which one was the most “genuine”. For a long time, it was considered that the A text was corrupt; now, the A text appears more genuine. Moreover, the name Mephistopheles (coming from the original German Faustbuch) is spelt differently in each version. Marlowe's play is based on a book of stories concerning the life of Johann Georg Faust. It was written by an anonymous German author under the title “Historia von D. Johann Fausten” in the latter half of the Sixteenth century, about 20 years prior to Marlowe writing it. A new publication was then released by publisher Johann Spies in 1587, seven years before the first performance of the play by the Admiral's men.